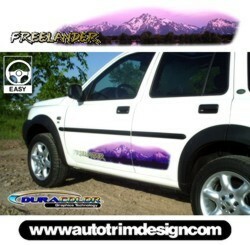 Add the unique look of these graphics to your Land Rover Freelander. Your vehicle is just as rugged as the mountains in the beautiful scenic image. The "Freelander" wording is designed with a White to Gold colored fade within a Black outline. It'll look great on any color vehicle!